As the city develops, we’re in danger of losing landmarks which are no longer deemed valuable by those in power. Lonsdale House is a recent example, though it’s not gone yet. 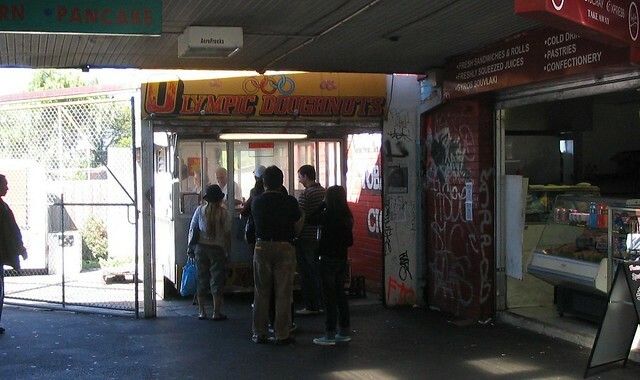 This is Olympic Doughnuts, outside Footscray Station, pictured in 2007. Since then, most of the surrounding shops have been demolished as part of the redevelopment of the station and surrounds. I’ve been wondering if it would survive. Perhaps in some kind of Shot Tower-like enclosure development around it? The only really alarming thing about the $52 million redevelopment of the station area has been the imagined threat to the much-loved doughnut van, which has been there for 30 years. So the wise authorities have arranged things so that it will remain untouched and be able to contribute its fats, carbs and delicious hot jam aromas to eager passers-by during the works. A Department of Planning and Community Development spokesman says the van will stay within the station area. Thank sweet goodness for that. They are the best doughnuts in Melbourne. I used to make trips from the city just for the doughnuts when I was at uni. I was wondering what happened to the van when I went past on the train a few weeks ago. All the buildings were gone, and no van to be seen. This is good news. I suspect lifts and escalators are seen as taking less space compared with disability-access compliant ramps, which have to be a particular gradient, with level areas every X metres.